11 04/05/2019 17/05/2019 £1053.15 On sale! Perfect for those who believe the best way to appreciate paradise is by jumping right into it. 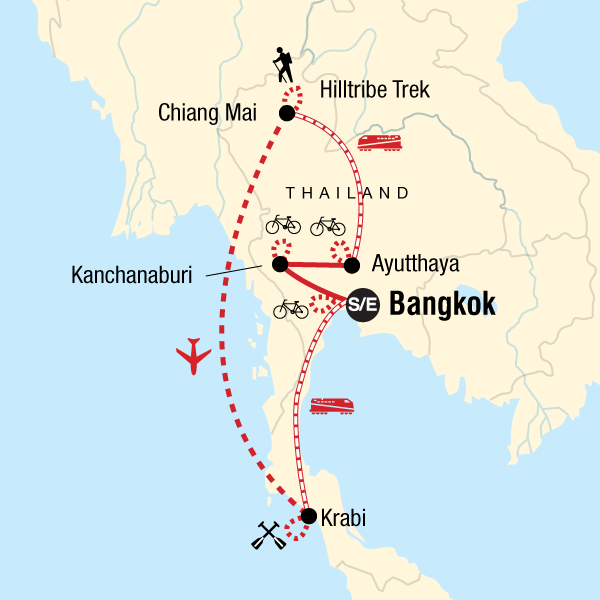 This adventure will have you hiking through forests and rice paddies, cycling through provincial villages, and experiencing Thailand's intriguing combination of culture and the great outdoors. Kayak the turquoise waters of the Andaman and discover coral coves and white-sand beaches. With the services of a Chief Experience Officer (CEO) and your accommodation and transport taken care of, this trip offers great value as it introduces the main sights of Thailand while offering up plenty of flexibility so you can experience an adventure you'll never forget. Explore Kanchanaburi on a cycling tour and enjoy the unique experience of spending the night on a floating rafthouse. Visit Erawan National Park and hike the many tiers of the famous waterfall and swim in the crystal-blue pools. Arrive in Chiang Mai in the morning before beginning the hilltribe trek. Experience the culture of northern Thailand with a homestay. Pack up and set off for the next village. The trek is longer today, the trail winds up and down on the way to a picnic lunch in the jungle. Afterwards, transfer to the Lahu village of Ban Mae Ma for an overnight stay. Opt to experience a traditional herbal sauna. Transfer from the resort to the train station for an overnight train to Bangkok.